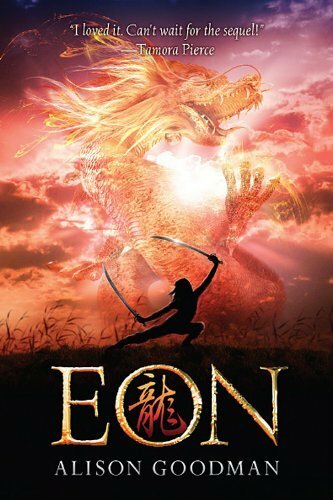 For years, Eon’s life has been focused on magical study and sword-work, with one goal; that he be chosen as a Dragoneye, an apprentice to one of the twelve energy dragons of good fortune. But Eon has a dangerous secret. He is actually Eona, a sixteen-year-old girl who has been masquerading as a twelve-year-old boy. Females are forbidden to use Dragon Magic; the penalty is death. When Eona’s secret threatens to come to light, she and her allies are plunged into grave danger and a struggle for the Imperial throne. Eona must find the strength and inner power to battle those who want to take her magic…and her life. A friend of mine read Eon before I did and he highly recommended it, so I signed it out from the library with very high expectations. After all, it was highly recommended and there has been quite a lot of buzz over it in the YA community. Finally, fantasy based on something other than a European culture! Alison Goodman deserves a medal for bringing a little more diversity into mainstream fantasy. She has also put a new spin on the old girl-pretending-to-be-a-boy cliché. And finally, a new type of dragon in fantasy! This has been the kind of fantasy I’ve been pleading for. Hopefully it will inspire new writers to dare to write non-traditional fantasy. Eona is an amazingly complex character. She has pretended to be a boy for so long that she’s very masculine, yet she is definitely female and has most of the problems teenage girls her age have. Her hip was broken and never fully healed, so she is considered to bring bad luck (being a ‘cripple’), but she still perseveres to reach her goal of becoming a Dragoneye apprentice. Rilla, Prince Kygo, Lady Dela and Lord Ido are all secondary characters, but they have been given just as much depth as Eona, which is a testament to Alison Goodman’s skill as an author. However, the most impressive part of Eon is the plotting. Unlike many authors, Alison Goodman is able to throw truly unexpected plot twists at her readers. Sure, I could predict some of the plot points, but there were many times I was truly surprised at the turn of events. This book is like a Mozart opera—you have to really pay attention or you’ll completely miss major plot points that seem insignificant at first. It definitely is! I’m just glad it was recommended to me first or I never would have read it. I had read the description once before, but it didn’t sound like much until I heard what you had to say. Book descriptions can be so unpredictable sometimes! I agree. I’ve shied away from books because of their horrible blurbs only to read them later and find out they’re amazing. You can’t judge a book by its cover– or its blurb for that matter!